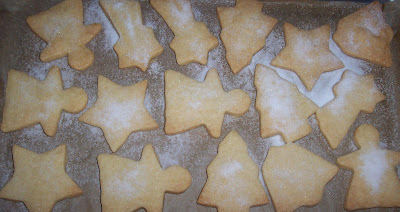 house of spoon: Christmas baking!! YAY!! 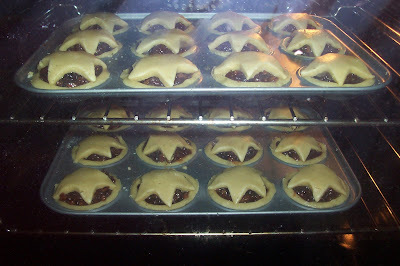 O it is my favourite baking time of the year!!! Spent all Saturday baking Christmas cakes, reindeer pops, cranberry sauce, butter shortbread, mincemeat, cranberry scones and mince pies!!! Was delighted with the taste of the shortbread, although less happy with this horrible dingy photo of it....just trust me, it is sugar-y butter-y heaven! There's such a great buzz about making mince pies the mincemeat is super fun to make and just smells like Christmas in a pot (cinnamon-y, spice-y, brandy-y, fruit-y, ginger-y) yum yum YUM!! 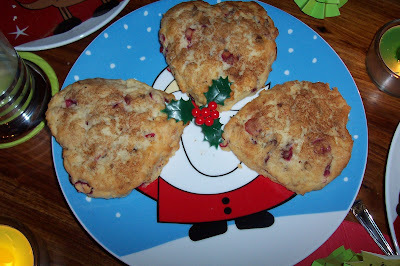 And the cranberry scones (in little *heart* shapes) spread when i wanted them to rise, ......but they were yummy so i won't hold that against them. Want proof??? Here's the plate with only 3 left! A Hex on your "Haus"